Published February 27th, 2010	in Business: Strategy. 0 Comments	Tags: BeatThat, Bizrate. 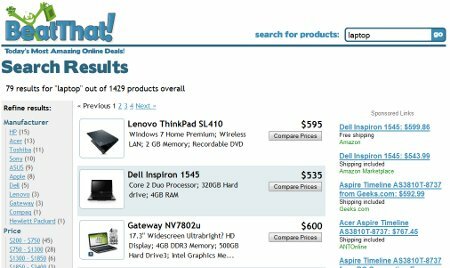 BeatThat, the deal site I reviewed in August of 2008 has gone through some dramatic transformation. 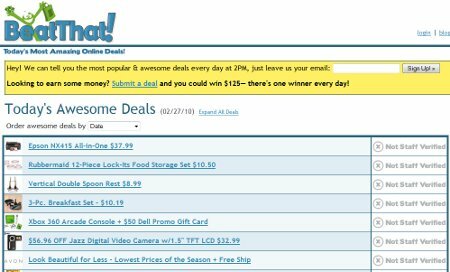 The home page which used to resemble a traditional price comparison site now simply shows shopping deals in a flat list and offers a daily prize for the best deal submission. This is definitely a step down from the approach the team took originally and I can only wonder why they decided to abandon it. I sent an email via the contact form and will update this post if I hear anything back. By the way, the old price comparison part of the site is still alive however it is completely outsourced to another provider, a common practice among price comparison sites - the product feed and all the links redirect via Bizrate. Interestingly there is no way to get there from the front page. You have to click “About Us” or “Contact Us” on the button (which is also a trick since the page keeps loading content as you scroll down) and then search any product using the search box at the top right. You will get a page like this (I searched for laptop).